After finishing the color, pattern, material can not fall, to say that we are most familiar with this cashmere scarf. A thick and warm cashmere scarf that gives you warmth while giving you warmth. Knitted scarves are bold and protect your neck, and it also has a retro charm, warm and elegant lady’s taste. This kind of faux fur is more suitable for the northeast of the cold and cold, more mature and gas field than the knitted scarf, it seems that warmth is not necessary. The first type of hanging method, the simplest and best-looking system, has just entered the cold and hot weather in winter. It’s too hot to hold around, it’s not convenient to take the hand. This kind of big brother on the beach is the method of the scarf and the practical value is good. The scarf naturally hangs around the neck for a long and short period of time. This kind of combination is not only fashionable but also visually stretches the overall lines, but also makes you domineering, and the female strongman should not miss it. When it was cold, the scarf was pressed inside the coat, and the warmth index rose linearly. The second round, this system is the most common and most casual, wrapped around the neck enough warm, one after the other can add a layering to your look. Casually on the shoulders, handsome and stylish walking with a full atmosphere. The extra-long style is more succinct and individual, and the tall girl can try it. The small man is more suitable for the short paragraph, clean and neat, the plaid scarf shows the British style has a charm. 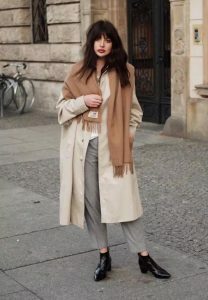 The third type of winding chest method, the scarf is too long, a few laps around the neck, more than one layer of warmth, the lap of the scarf while keeping warm, the fluffy feeling can also modify the face Lines, in other words, small faces! ! The scarf of the chest does not have to care about whether it is symmetrical, and the long and short method is more fashionable and lazy. Use a scarf to give you the opportunity to change your hair style. The hair that is pressed inside the scarf should not be pulled out. This fashionable and sophisticated dressing is learned. The fourth multi-circle bib method, to say that the front is just to modify the face lines, this method can help you resist the long chin and the big round face! ! Let you easily become a heroine of Korean drama. The scarf is only piled on the neck, avoiding bloated elsewhere, and more matching with the wool hat. 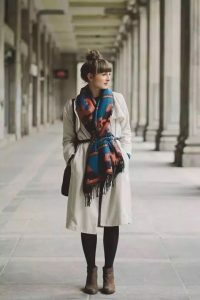 The fifth kind of shawl method, the scarf can also change the shawl, yes, you have not misunderstood, the premise is that your scarf is big, warm and wind-resistant, but also add elegance to you, create a delicate goddess. Casually draped over the shoulders can highlight the French lazy and romantic style. Scarves as shawls can’t avoid the wideness of the upper body, so try to play the advantage of wide and narrow. The sixth type of belt fixation method, at this time there is no fixed method for the scarf system. The front hanging neck method and the shawl method can be applied. A waist belt is attached to the waist to highlight the waist line and is more neat.